1.) In what way are you involved with an environmental project? Since 2003 I have participated in many beach cleans ranging from the top of the North Island all the way down to Stewart Island beyond the South Island nearing towards Antarctica. Over the summer months it is very rewarding work. Since 2008 I have been working on a project called “more trees, more bees”. I designed the project in 2008 to further educate and raise awareness about the important role that trees and bees play in our environment. I hope to turn the concept into a children’s book to teach children in an enjoyable and interesting way. I would also like to make a series of ‘you can too’ video clips about basic gardening techniques that will encourage healthy home and living environments. I have been recommending everyone too establish worm farming and organic composting heaps. I recently expanded and started both of these practices at my Father’s farm. Last night he phoned to tell me that the worm farm is already producing 20 liters of worm juice every month. Since he has been watering the gardens and orchard with the worm juice, he has noticed the plants are flourishing and the fruit trees are producing an abundance of healthy flowers and fruit. He said that he finally sees why I was so persistent about establishing one. By having a worm farm you reduce the amount of waste in landfills. Recycling food scraps and organic waste this way creates ‘super boost’ plant food. It’s fantastic! I highly recommend worm farming to everyone! Your garden will love you for it and I will too! In the future, I plan to team up with the legendary Mike Bhana (who is the director and producer at Wilmfilm Productions. www.wildfilm.tv/Mike_Bhana.html.) To put together a series of weekly Youtube clips that will make an hour long documentary. Hopefully, this will feature the ‘Lady Sharks’ (a girl group I created for fun with my friends during a women’s fishing competition). The documentary will be to encourage conservation around the protection of our oceans and ocean wild life. Note: The script is confidential but you may or may not get to see me inside a shark cage, submerged into freezing water, surrounded by the magnificent Great White shark. Hopefully, we will be able to film this in 3D with ‘leotard loving lady sharks’. It is a project I look forward to pursuing later this year. Also randomly I have been raving and promoting people to invest in a product a friend in the textile industry has recently introduced to the Carpet market. It’s called ‘eco-strand’. It’s a new carpet made from recycled plastic bottles and cornstarch that is guaranteed for 25 years not to stain, fade or unravel. I like it because I believe it is an inventive solution for a major environmental problem and a healthy household investment. Every day I try to come up with new solutions and ideas for making a better tomorrow. I only hope that I can continue to make a difference and do more with every step. 2.) Name the three most important things that everyone should do to help preserve the environment. For example: Recycled Glass is one of the easiest and best materials to recycle. Glass can be fully recycled without any loss of purity. It takes less energy to melt recycled glass than it does to make new glass from raw materials. It helps to reduce pollution and importantly, it helps to reduce landfill. 3.) What are your qualities that you think will make you a good Miss Earth? I have passion, courage, a voice and the heart it takes to change the world. I never give up, I just find another way. Off the beaten track, over the far away mountain, I will find a way to make this world smile again. If we fail the Earth, we have nothing. I am the voice for the Earth, I see her tears, hear her call, sense her fear and understand her pain. Mother Earth needs a voice, like the animals that walk alongside us. We must look beyond our noses to evolve, to understand and to listen to a frequency that is not a chartable language. It takes the intuition of a woman to feel what mankind takes for granted. I have always had a special connection to nature, animals and children. I am practical, caring, compassionate, head strong, determined and far too trusting. I have a view that there is no such thing as a bad action. Some of the worst things that happen in this world have better outcomes than some of the best actions. It is important that we stay positive and make the most of every situation. We have a lot to learn and I don’t mean from a textbook. To share a vision and to establish friendships that endure, are two of the most important aspects of my participation in Miss Earth. As Miss Earth NZ11, I know I can make a positive difference connecting with the global community where we can all share common interests and environmental ambitions. I believe I am Miss Earth. 4.) 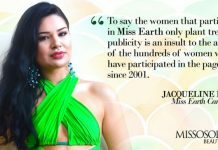 What is the essence of Miss Earth pageant? I feel the essence of the Miss Earth Pageant is to recognize intelligent young women who are outstanding achievers in their environment and who have the potential to become future leaders at a policy making level. 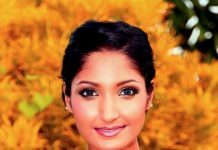 I also think the Miss Earth pageant is an opportunity to celebrate global community efforts, to acknowledge the emerging leading female environmental advocates and to raise awareness of current global policies. 5.) Can you give us a rough description of your National Costume? This year I am promoting the national identity of my country using the indigenous Maori name and meaning for New Zealand. Aotearoa – ‘the land of the long white cloud’. My costume is mainly white; the bodice is embellished with a jeweled Southern Cross to acknowledge the constellation used by early adventurers to make their way home to New Zealand, where my heart lives. The white skirt is decorated with glittery silver ferns that represent both our national netball team the ‘Silver Ferns’ and our native tree fern whose fronds are green on the upper side and silver beneath, also known as a “Punga”. 6.) What is inside your bag right now? 7.) Describe the town or city where you grew up. I grew up in New Zealand in a city called Auckland. I was raised in a suburb called Titirangi, with regular holidays at a beach called Whangamata. This provided me with a wide range of environments from the dense native bush of West Auckland to the golden beaches of the East Coast of the North Island. Titirangi is well known for its educated, artistic residents and their commitment to a sustainable environment. I have always had a strong connection with the natural world and I believe my early childhood experiences’ living in Titirangi is where it all started. In West Auckland we have the best recycling facilities available in the country thanks to our previous Mayor, Bob Harvey. He was and continues to be an inspirational leader and valued mentor in the local community. I have a great deal of respect for where I grew up. Thankfully, legislation protects the coastal rainforest I love so much. However, the threat of suburban sprawl is something we need to remain acutely aware of. We need to learn to preserve what is sacred and rare. The forest and precious native birdlife is irreplaceable. Teaching and learning to be more resourceful, less wasteful and less environmentally destructive is very important for our future. The quality of air, water, land and forests depends on it. 8.) Tell us something that most people don’t know about you. There are a number of things that most people don’t know about me. Randomly, Antarctica would be the place I would most like to travel to celebrate a special occasion, like a wedding. I like painting abstract art on the weekends; usually based on scientific images or equations I find reading textbooks or encyclopedias. I almost started a telecommunication network that I had the Australasian right too, but there were too many issues with line rentals from other companies. I started an online organic clothing business when I was 18, which I traded in after the global recession. I have stacks of workbooks full of inventions that I am waiting to implement, including emergency relief ‘safe water’ treatment packs so people are able to make safe drinking water anywhere and because I like to believe in the goodness of people I can be a little gullible, so please don’t lie to me…. Be a friend I just haven’t had the chance to meet yet. Act like a star and shine like one! We are one of a kind and I love you all. Next articleMiss Germany and Miss Earth – will it open a new era for Europe?